Blues InterchangeMitch Robinson off due to an injury. Blues InterchangeHeath Scotland off due to an injury. 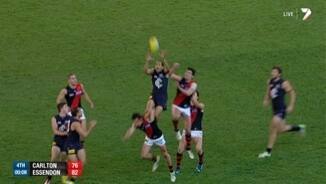 Bombers InterchangePaddy Ryder off due to the blood rule. Bombers InterchangeJake Melksham off due to an injury. 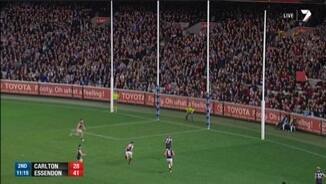 BEHIND BLUESDuigan has a snap from 35 out, the ball is high and just wide for a behind. BEHIND BLUESGoddard is trapped on the last line of defence, there is a team mate goal side of him who he shoots the hand pass out to and luckily he is behind the line...rushed behind. GOAL BOMBERSCrameri marks on the wing and is then awarded a 50 after someone strays over the mark...from inside the arc he has no trouble scoring the Bombers first. The ball is bounced and the Blues go straight into attack, however the Dons repel the attack and work the ball out of defence. Essendon have won the toss that's something...isn't it? Late changes for the Blues with Kreuzer and Walker being replaced by Duigan and Joseph. The Subs are Howlett for the Dons and Graham for the Blues. Welcome to the MCG and the clash between the Bombers and the Blues. Essendon are a team in crisis both on and off the field, facing traditional rivals Carlton...can they find something extra tonight? Welcome to MCG for the Carlton v Essendon Round 22 clash. A GOAL to David Zaharakis in the dying seconds has given Essendon a stunning and emotional six-point win over a wasteful Carlton at the MCG on Saturday night. 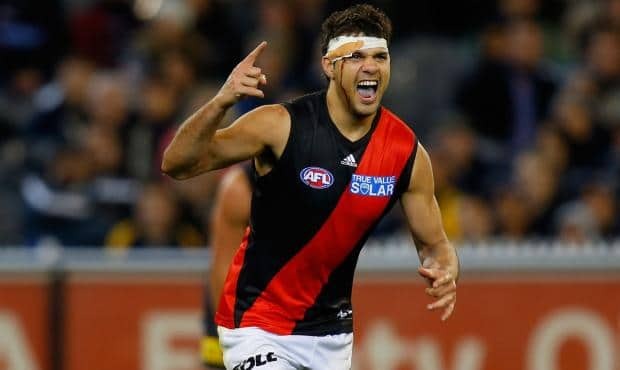 Following yet another tumultuous week as a resolution to the supplements saga draws near, the Bombers put their off-field woes aside to turn a 20-point third quarter deficit into a 12.10 (82) to 9.22 (76) victory in front of 53,630 fans. That Zaharakis kicked the winning goal was fitting, given it was he who sparked the late fightback with a superb 11-disposal final quarter. The win snapped a dismal four-game losing streak for James Hird's men, which had seen them tumble from second to seventh on the ladder. 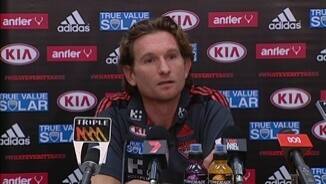 "It was a terrific win," HIrd said. "It just shows the courage and the heart of the players we've got. "I think to come out and play that way after the week we've had is pretty amazing." But the inspiring effort may be in vain, with negotiations between the club and the AFL appearing increasingly likely to see Essendon stripped of premiership points and removed from this year's finals. Reports have also suggested that Hird could receive a lengthy suspension as part of the negotiated outcome, something he said he may be prepared to accept if it spared the club harsh penalties. The loss ends Carlton's hopes of overtaking Port Adelaide in eighth, but with ninth place now a chance to be enough for a September berth, the Blues remain in finals calculations. 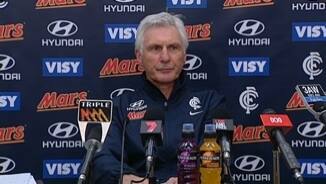 However, a furious Carlton coach Mick Malthouse said he did not wish to consider that possibility. "Not one little bit interested," he said. "We came here tonight to win, and we didn't win. "I don't know what's going to take place, I don't care what's going to take place. "We play Port next week, and technically we can't make the eight." 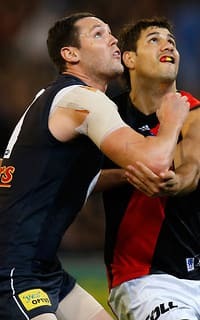 Bombers skipper Jobe Watson, booed by Carlton fans every time he went near the ball, led his team with distinction, gathering 27 disposals and booting two goals in the face of a close tag from Bryce Gibbs. Brendon Goddard also had 27 touches, while fellow midfielder Heath Hocking went head-to-head with Marc Murphy, with both players finishing with 22 disposals. Hocking is certain to face scrutiny from the Match Review Panel for an elbow to Chris Yarran's head during the third quarter. Michael Hurley kicked three goals and hit every contest with aggression, while Stewart Crameri contributed two despite struggling with a sore right ankle. For the Blues, veteran midfielder Kade Simpson was a standout, gathering 32 disposals. He almost single-handedly saved the game in its final moments, twice putting his body on the line to take a mark and then win a free kick on the last line of defence. Small forward Yarran played one of his better games for the season, booting two goals and chasing, tackling and blocking with intent. Tom Bell and Mitch Robinson were other useful contributors, but Malthouse's team was ultimately left to rue their dismal 29 per cent conversion rate in front of goal. The Blues were dealt a double blow 90 minutes before the bounce, with key players Andrew Walker (gastro) and Matthew Kreuzer (calf) both late withdrawals. They then lost Brock McLean during the first quarter with a right quad injury. Walker and Kreuzer's absence opened the door for forgotten backman Nick Duigan to play his first senior game since round one, and the South Australian responded with 13 disposals and 0.2.